I’ve finally signed up for MS 50025A. I know that soon it will be outdated. But to be honest I really want to finally get some training in PS area. I know how valuable it can in opposite to reading articles/ books – I’ve seen it with VBS. It will be in June, so I should have TFM already. But I guess I will take course first and move on with the book soon after. OK, I’m really having fun while taking part in Scripting Games. Writing script with a purpose, even if this is something I would personally never use, helps a lot when you are trying to know new technology. I love writing cmdlet scripts, because it so simple to get parameters, write help, provide examples, and so long, and so forth, that it’s really hard to resist. There is one thing though I can’t understand. I’ve decided to do “Advanced” scenarios, and I feel comfortable with it. However it’s not hard to notice that there are people out there who do both. I wonder what’s the point? Most of scenarios for beginner are those for advanced with some pieces cut off. In other words: if you created script for adv it’s only a matter of deleting few lines to create beg as well. Of course it does not harm me in any way, I’m glad that I got so many points already, but… why? In my opinion it should be different: either scenarios should be written in a way that prevent such a easy-solution (write once, submit twice) or it should be clearly stated that one can only submit to each event with selected level. $TempUser = Read-Host -Prompt "Please enter alternate username"
$TempPass = Read-Host -AsSecureString -Prompt "Please enter password"
D:ScriptsPowerShellUpdate-RemoteRegistry.ps1 : Cannot validate argument on parameter 'RegistryKey'. The argument "HKLM:Software*ScriptingGuys2010ScriptingGames" does not match the "^HK(LM|CU):\[^*? :<>|]+$" pattern. Supply an argument that matches "^HK(LM|CU):\[^*? :<>|]+$" and try the command again. But it’s so ‘geeky’ that I can hardly resist it. And, after all, it won’t be ‘normal user’ who will use this cmdlet, right? OK, so ScriptingGames are started. First task looks pretty cool. I’m not very familiar with working on a registry keys using PowerShell, so it’s great opportunity to start using it also for reg-related tasks. First problem I went into is mkdir behaviour within this PRProvider. So let’s assume $RegistryPath does not exist. What should I do? Write-Debug "$RegistryParent <= folder; $i <= index"
Book, tab and the rest. And I guess the reason why it’s not able to see my hidden folders is that it uses Resolve-Path, which has no –Force parameter (one that is necessary to get hidden folders while using Get-ChildItem). But I’m not 100% sure, after all I’m not the author of this function. 😉 Sad if you really need to use hidden folders from time to time and they have spaces in names (Local Settings would be a good example). I’m really big fan of one liners. When I was playing with bash, cmd and other shells I liked the idea of doing something in one, single line. One problem though: you had to think all the time what comes out of the first command in the pipeline. Than do the same for the next. And again, and again… Quite frustrating and really difficult to develop. And once you did it – you’ve tried to launch it on a different OS version, where output looked slightly different and *BOOM* – unpredictable results. 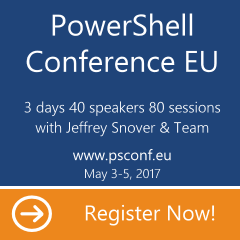 It’s totally different story with PowerShell. Piped object is usually easy to track, modify, pushed to next pipe element. In fact the only thing that was better in text consoles (and I hope it’s feature that will be added in next PowerShell version) is && and || which I used a lot both in batch and cmd. (gqadu is alias that I use for Get-QADUser).